It takes an opera company with a depth of resources and talent to do justice to Verdi’s monumental, grand opera. 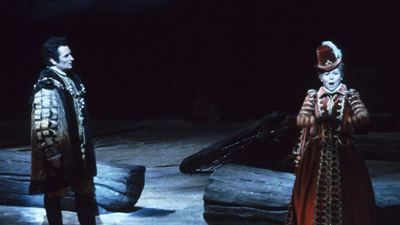 Under James Levine’s authoritative and impassioned direction, René Pape gives a monumental portrayal of King Philip, who must come to grips with the consequences of his actions: marrying Elizabeth (Patricia Racette) when she had been promised to his son, Don Carlo (Johan Botha), who opposes Philip politically. Olga Borodina is a sumptuous Eboli, Elizabeth’s rival, and Dmitri Hvorostovsky is magnetic as Carlo’s best friend Rodrigo.